This article outlines how to create an email template within the CRM. Document Templates help to ensure all messages being sent to your customers are on brand, whilst also saving CRM users time & effort. If you require a word or excel template created please get in touch with our Customer Service Team for further assistance. Please note that you will need Prospect 365 Administrator rights to configure document templates within the CRM. To edit your Email Templates, click on the settings icon in the bottom left-hand corner. Once within the Settings Centre, navigate to the Emails & Documents section & scroll down until you reach the Document Templates configure option. By clicking on the 'Click to Configure' link the Configure Document Template window will open. To create a new email template click on the + icon. You will then be asked to fill out various bits of information about the new email template. Description: This will be the name of the email template that appears in the template drop down, so make sure this is relevant to all CRM users. Type: You have three types of document templates; email, Excel & Word. For this example we would select email. Extended Description: If required you can provide a more detailed description of when this document template would be used. Where are you going to use this? : Please select the CRM record type that you wish to create & use this template against. Once happy with the information entered click Create. 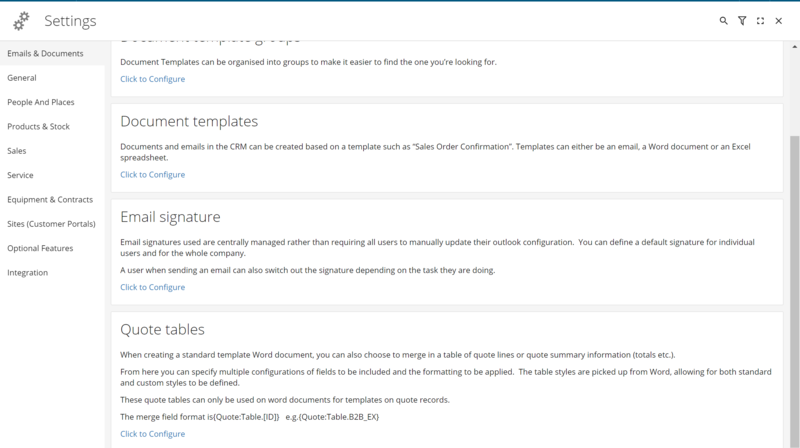 Your new template will then appear in the Configure list. To start editing this template click on the pencil icon & click edit. This will then open the Edit Template window where you can start typing out the email body. We would recommend using the search & replace fields where you can help save time. On the right-hand side you have a tree like view of all the possible search & replace fields, linking to the record type that this template will be used against. Once you're happy with your new email template click the Save button & you have now created your new email template. For more information on how to use this email template take a look at Using your Quote Document Template.